I love finding a new way of making something, especially when it’s something so obvious and you wonder why you never thought of it yourself. I saw this over at It’s All Gouda. 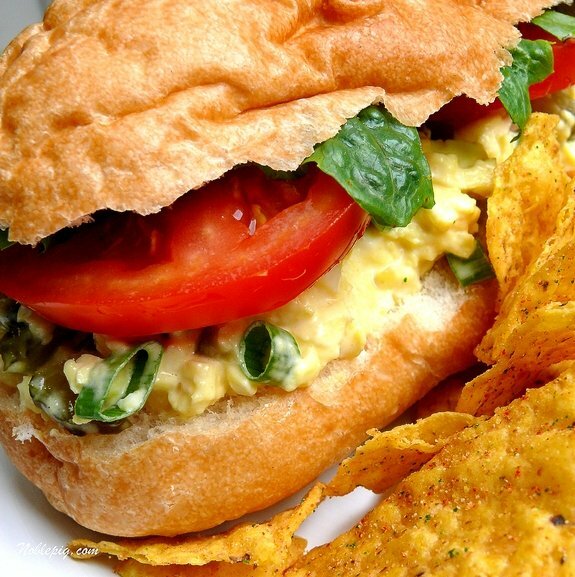 Paula used scrambled eggs, as opposed to hard-boiled eggs, to make egg salad for a sandwich. Brilliant! I love egg salad but by the time I remember to boil the eggs, well, it just never happens. This method makes egg salad available all the time, without forethought. Perfect. My husband loved it, especially because I served it with Cool Ranch Doritos. Does anyone else have trouble functioning when there is an open bag of Cool Ranch Doritos in the house? I swear that bag calls to me from the cupboard until it’s gone. Maybe it’s just me. I can live with that. I scrambled seven, large eggs (whatever was left in the carton) in a nonstick pan. I then turned them out on a cutting board and gave them a good chop. I added the chopped eggs to a bowl along with 1/2 cup mayonnaise, 1 Tablespoon mustard, 1/4 cup chopped green onion, 4 diced sweet pickles and salt and pepper to taste. Mix until you have your desired consistency. I served it on a hoagie roll with romaine lettuce and thick sliced tomato. You can make any version of egg salad you want, just use scrambled eggs, it’s so much easier. Scramble seven, large eggs in a nonstick pan. Turn them out on a cutting board and give them a good chop. 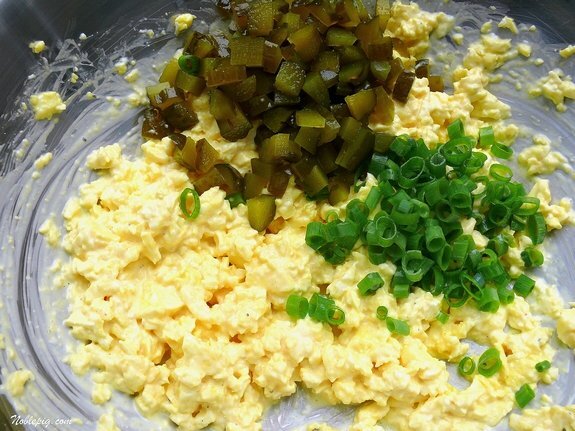 Add the chopped eggs to a bowl along with 1/2 cup mayonnaise, 1 Tablespoon mustard, 1/4 cup chopped green onion, 4 diced sweet pickles and salt and pepper to taste. Mix until you have your desired consistency. Refrigerate for one hour or longer before serving on your favorite bread or roll. Amounts of ingredients will change depending on how many eggs you use. That’s brilliant! I also like sweet pickles in my egg (and tuna) salad! And now that cucumber season is here, I’ll start making my own. 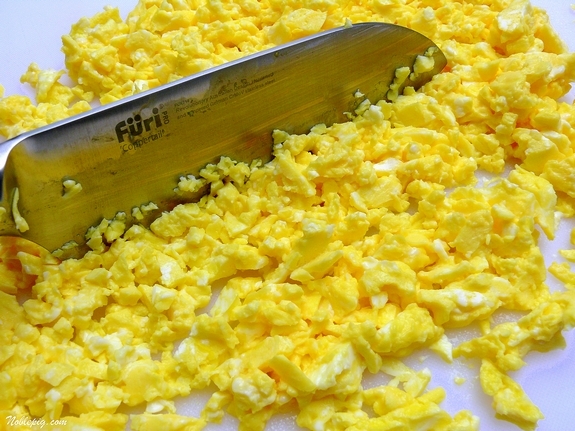 I love egg salad but I never thought of using scrambled eggs. Clever idea! I know I will have to try this now. I never thought of it either but your photos are just jumping off the page and looking delicious. Yes, that is absolute genious!! Looks so delicious! Yes, yes, yes! Why didn’t we think of this before? It’s inspired. I love the idea too! Mmmmmmmm! Yeah, it would have taken me a lifetime to think of that! wow! I saw this on Paula’s blog also and thought it was brilliant. What a timesaver! Beautiful photo, Cathy. O yummers! What a great idea! Thank you! I like my egg salad with horseradish. The kids love egg salad, but we all hate boiling eggs. They’re gonna LOVE this. What a great recipe! I always have left over scrambled eggs and never know what to do with them. YUM! What?! Why didn’t we think of that before! GREAT idea! I may try it this week with some awesome pastured eggs I got at the farmer’s market. Thanks for the tip! Awesome idea. Good way to use up a lot of eggs from our hens. Thanks for the recipe. Such a wonderful idea! Now I can have egg salad whenever the urge hits and won’t have to wait for th eeffs to boil! Awesome recipe!! 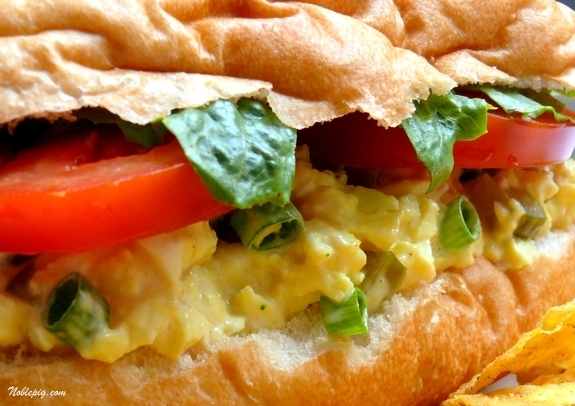 My husband loves scrambled egg sandwiches, but I never would have thought to make egg salad with scrambled eggs. Your photos make me want one NOW!! And my Doritos of choice would be the Nacho Cheese, but even harder for me to resist are Crunchy Cheetos! I’ve been craving egg salad sandwiches lately, but agree with you that when you have to start with hard boiling and cooking the eggs, something else just makes itself available at the moment. But scrambled eggs? I can do that! Oh man this is brilliant! I am SOOOO making this! You rock! A brilliant thought! This just made may favorite sandwich even more so now!!! Thanks for sharing. I love scrambled eggs, I love egg salad, and I LOVE this idea! What a great idea! I don’t like hard boiled eggs, but I do like scrambled eggs. And, I just had a root canal done, so this would be something that I can eat now. Thanks again Kathy! I’m not so enamored of sweet pickles or tomatoes, but I am going to try this just the same, sans the above ingredients because I’m intrigued by the idea of using scrambled eggs vs. hard boiled! LOVE this. 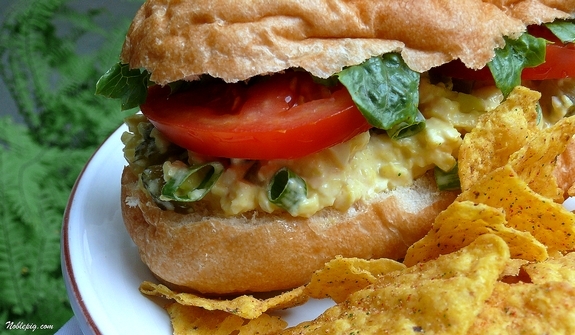 I’ve made leftover scrambled egg sandwiches before, but this sounds even better. And yes…Cool Ranch Doritos are an evil snack. I can’t resist them. I have to admit, I’ve NEVER had egg salad. I’m not sure why, cause this looks great! It’s funny how you get so used to having a dish a certain way that you don’t even think about the other possibilities. Definitely have to try this with scrambled eggs. That’s kinda genius. I wonder if this would work with Egg Beaters…I’m so making this either way though. I LOOOOOOOOVE egg salad but rarely have it because of my high cholesterol. : ( Yum!!! Thanks for the inspiration. Oh and the Doritos thing…I’m so there with you. That and with those new Pop chips… I swear I keep going back to the cupboard. Dangerous, I say! I saw this on Paula’s site and thought it was a brilliant idea. Your sandwich looks tasty – love the pickles. this is awesome…my mom used to make us egg sandwiches like this only she didn’t chop it up – she just whipped the egg, fried it sometimes with onions, peppers, mushrooms and would put it between bread with mayo. oh, yum. now I want one! That is such a good idea because often for my meals, especially lunch, I can’t think of or find a quick protein to have. And you’re right–I never take the time to hard boil eggs. Your sammies look de-lish! I’m trying the Scrambled Egg Salad tomorrow for lunch. Great idea. However, I’m not a sweet pickle person, so I’ll be using dill. I know a lot of people are opposed to the dill pickle when it comes to eggs (deviled eggs, etc. ), but it’s my favorite. I agree with the doritoes comment and the sandwich is delish. I rolled mine in a tortilla. I saw this on Paula’s site. Very cool idea. What a great twist on an old favorite!! Great idea thanks for sharing with your peoples! I saw this when Paula wrote it last week, and thought it was brilliant (although I did make a wisecrack about “What are leftovers?”). Love your pictures. No way! I love egg salad, but like everyone else, rarely make it because I’m too scatter-brained to get around to making the hard boiled eggs for it. Definitely on my list now! Seriously gorgeous looking sandwich Cathy. Couldn’t be more perfect! Great idea! My husband and I love egg salad, but we like it with only mayo, a bit of mustard, and some salt and pepper. I’ll have to try this out sometime. Now that is different. Yep would have NEVER thought of it. great idea, my husbadn would love this. Though for me, it isn’t the cool ranch doritos but the sour cream and cheddar potato chips. I think I now know what we’ll be having for dinner tonight before heading out to catch a movie… Thanks! What a great idea. It takes much less time to scramble than it does to boil. Best of all, since the consistency is already soft, you use less mayo, which makes it lower in fat (unless you like to cook your eggs in lots of bacon fat, but of course I’d never – *ahem* – do that. *cough* Nope. Not me. My hubby loves egg salad. I should try this for him. This is a seriously great idea. Who Knew? Great idear you have there! Love egg salad too. Just a very cool idea Cathy. I like it better than the boiled egg option! GREAT!! As always a great idea. I am not a big fan of egg salad, but tuna and egg salad is real good. The tuna is not strong and it just seems more festive with the egg. Brilliant! Will be making this for lunch tomorrow and will have it over fresh spinach and other greens. Yum. Brilliant! I have the same issue with wanting egg salad, but not taking the time to boil the eggs! I’m definitely doing this next time. I am linking back to this post on Wednesday…this post provided miracles in my life. That is definitely an interesting way to make egg salad. I’ll have to try that the next time I make egg salad. Interesting recipe! My family would love it. Paula has some great ideas. I would never have thought of using scrambled eggs but I’m intrigued with the idea. Sometimes we really do need to just think outside the box, don’t we? It’s perfect for a quick lunch or dinner. Thanks! I hate peeling hard boiled eggs, so I definitely need to try this version! Yup, it’s a great idea for many reasons. No boiling, no guessing when the eggs are done, no over boiling, nor forgetting you’re boiling eggs. I’m in…. Just lunch…just give me lunch at your table. Yum. Such a smart way to make egg salad/sandwich. The texture will be creamier for sure. Not too keen on little bits of bathmat egg whites. scrambling is such a great idea! Sometimes when I hardboil eggs, they end up getting overcooked and eggy, but this will definitely make it easier and quicker! That is one great idea! Can’t wait to try this. Oh yummy! This looks great for a quick meal on a warm night. In and out of the kitchen quick and not heating up the place. Right on! I â™¥ egg salad sandwiches…..this sounds so yummy and as far as Dorito’s….I am surprised my kiddo’s weren’t born orange……when I was prego….I definately ate my share…..LOVE THEM! Off to scramble some eggs……..
Love this idea– it looks fabulous. And, I wanted to let you know that I left you an award on my blog. I’m loving your recipes and am so glad I found you! WHat a neat idea! I’ve got to try this! I love this idea! I love egg salad and I also hate making it. I hate peeling boiled eggs–I swear that just turns me off faster than anything. I am so lousy at it. This recipe is a great idea. Also, would like to know what kind of camera do you use because your photos are awesome! 11:00 PM and my mouth is salivating from that sandwich. A lot of specialists tell that loan help people to live the way they want, because they are able to feel free to buy needed stuff. Furthermore, some banks give commercial loan for different persons. I’m convinced that Doritos contain some kind of addictive ingredient in them. Perhaps crack. I just don’t know. But yum to this recipe. My son LOVES egg salad – but hates making it…he just asked me if making egg salad with scrambled eggs is possible – he thinks it would be faster…so I googled it and this is what I found – AMAZING – now I have to try it !!! I have NEVER liked egg salad, but always loved scrambled eggs. Recently found I like peppers and eggs, so I’m thinking of trying this with the cooked peppers and eggs diced and mixed with mayo, salt and pepper. Maybe, just maybe, I’ll have another way to eat eggs! Great idea! Thanks for the idea!We had a slumber party for my daughter and five of her friends. I never thought of egg salad with scrambled eggs. It’s a great way to re-use them. Mix eggs in a bowl with a table spoon (Tbsp) of Dijon mustard, Tbsp of Worshire sauce. In pan saute with butter Vegetables. Pour egg mixture into the pan and scramble the eggs with vegetables until scrambled. Serve hot for scrambled egg breakfast. or mix mayonaise with it to make egg salad that u can put on bread or salad and put egg salad in the fridge for 30 minutes to get cold. Then serve as sandwitch or salad topping. Since my roommate will not eat eggs any other way than scrambled, I was looking for a recipe specifically for scrambled egg salad. The sweet pickles and green onions caught my eye and I will be trying this soon! We love this sandwich, I hope you guys do too! I dropped a carton of eggs and 9 broke. I thought of this recipe and was able to use the cracked eggs rather than throw them out. I’m surprised that this is a new idea to so many people! This was the first way that I learned to make egg salad more than 30 years ago. In fact, my wife and daughter made egg salad with leftover Easter eggs the other day, and I was honestly shocked when they made it with hard boiled eggs!